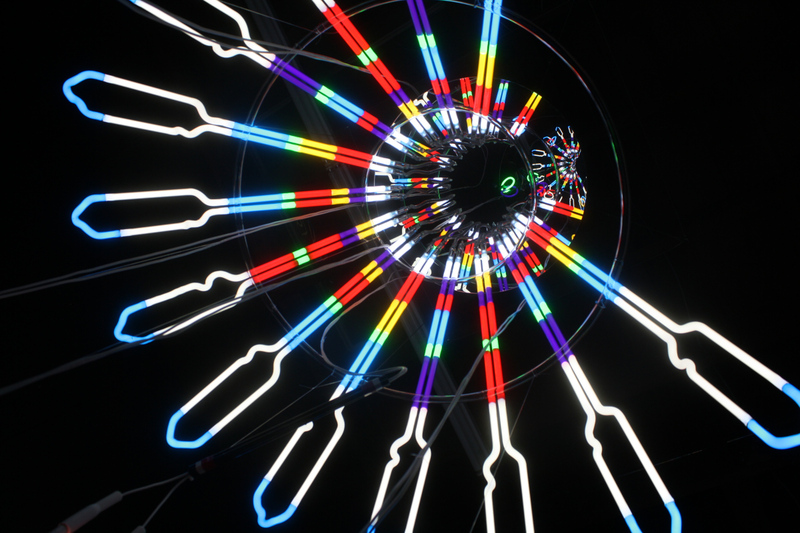 Seattle Based artist duo with a background in photography, Cedar Mannan & Lia Yaranon Hall are using light and neon in sculpture and installation. They have won the first place at the City Arts’ 2015 spring Art Walk Awards for piece “This is About the Stories” in collaboration with Sherman Alexie. They have installed Glenn Ligon’s piece “Blues Blood Bruise” through Lite Brite Neon at the 2015 Venice Biennial and Martin Creed’s “MOTHERS” No. 1357, was installed in front of the MCA in Chicago. Mannan and Yaranon Hall started Noble Neon in 2012 creating handmade neon light fixtures and signage in Seattle, WA. They aspire to bring neon off the wall and design new ways to feature the luminous neon tube. They hope to bring the alchemical quality of the fourth most abundant element in the universe to the observer, to encourage one to become more present, to ponder the language of light and to experience a glimmer of what the light is like where stars are born. Cedar Mannan and Lia Hall are both Pacific Northwest natives—she’s from Seattle, he grew up in the woods of southwest Washington without electricity. Mannan took a neon class at Evergreen State College. For the last 16 years he’s worked in the neon industry with companies in Seattle to Lite Brite Neon Studio in Brooklyn. Hall had a dream at age 13. Before falling asleep one night she asked herself what she would do when she grew up. In her dream she was handed a manila envelop on which was written in permanent marker: “Electric Colors”. Over a decade later, she met Mannan the night she graduated from the New School with an MFA in poetry. He then brought her on her first neon install of James Franco’s art piece “Three’s Company” at Sundance Film Festival. Their first publicly exhibited artwork, “This Is About the Stories,” at Method Gallery, is the result of an ekphrastic exercise, based on the interaction between a poem by Sherman Alexie and their neon response.